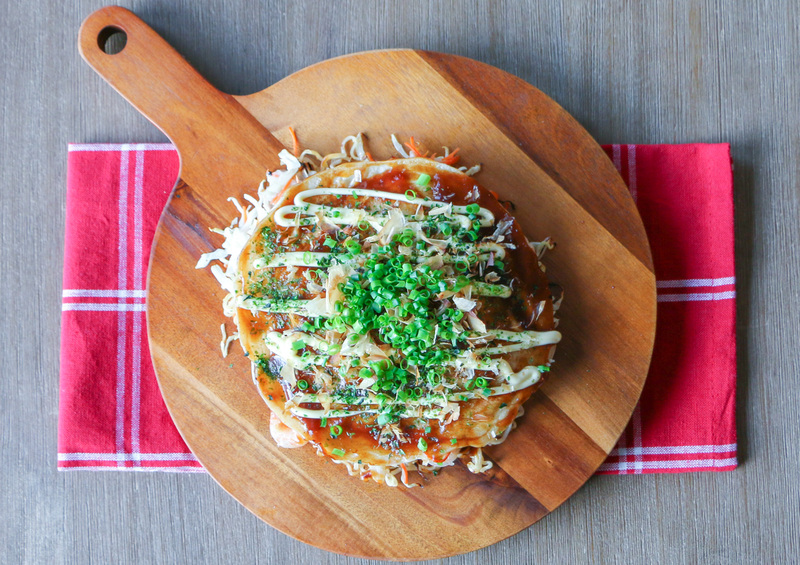 Okonomiyaki (お好み焼き) is a savoury Japanese pancake that is an instant favourite with anyone who eats it. It consists mainly of batter, lots and lots of shredded cabbage, and a multitude of additional ingredients which suits its name perfectly – “grilled as you like it”. Depending on the region in Japan, ingredients can range from shrimp, squid, octopus, oyster, pork belly, mentaiko, nagaimo, bean sprouts, mochi, konnyaku, tenkasu, noodles, cheese, and the list goes on. 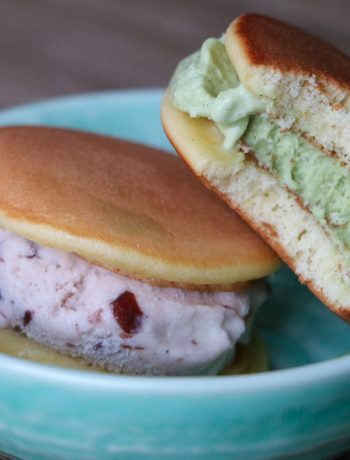 You’ve may have also heard it being referred to as Japanese pizza or Japanese pancake. It’s definitely not a pizza, but maybe in the sense that you can add a variety of toppings to your liking. There are two main styles of okonomiyaki, Kansai (Osaka) style and Hiroshima style (among others such as negiyaki, monjayaki, etc.). I grew up eating and making Kansai style okonomiyaki because my mom is from Osaka. It was always a dish that was made when we were pressed for time or wanted to clean out the fridge. 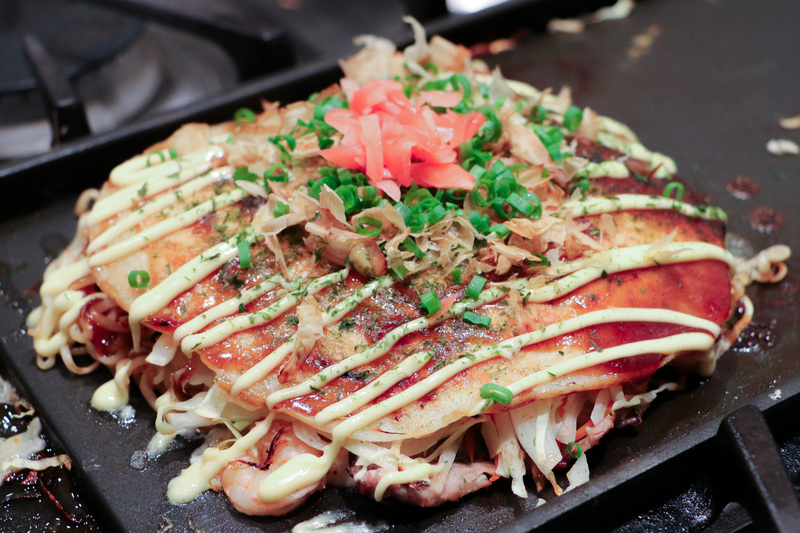 Kansai style okonomiyaki has a batter that is made with flour, dashi broth, nagaimo, and egg. 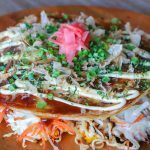 The ingredients are then mixed into the batter and cooked like a pancake, whereas Hiroshima style, the ingredients are layered and usually includes waaay more cabbage, yakisoba and a fried egg. Here’s a really grainy still from a video I took at an okonomiyaki restaurant, you can see the two styles of okonomiyaki. 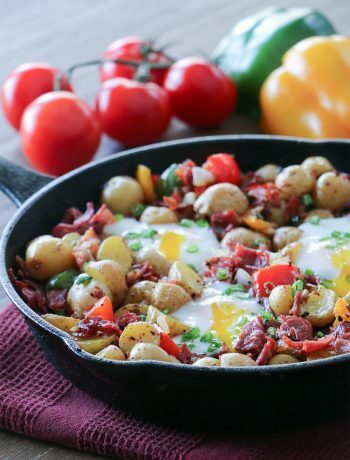 This layering technique makes it quite difficult and time consuming for the home cook because most people do not have a huge flat top in their kitchen, therefore requiring multiple pans to be used, lots of flipping, and lots of loose cabbage spilling… BUT it is delicious and definitely deserves a try! It’s ok to get messy in the kitchen every now, especially when it results in something so amazing! I’ve made this 4 or 5 times now and every time I am getting more efficient and less messy! (Yay!) I’d give myself a couple more times before I can say I have truly mastered this. I usually start by cooking the noodles first so they are ready to be used when I need them. Yakisoba packages will typically come with aonori and yakisoba seasoning, keep the aonori if you don’t have any on hand, this will be used as a garnish. The seasoning packet can also be used for flavouring the noodles instead of using the okonomiyaki sauce – it’s all up to you, they both taste great. Next up, you want to create the batter. Mix the flour and dashi broth. If you do not have any dashi on hand, don’t worry you can just use water and a pinch of salt. 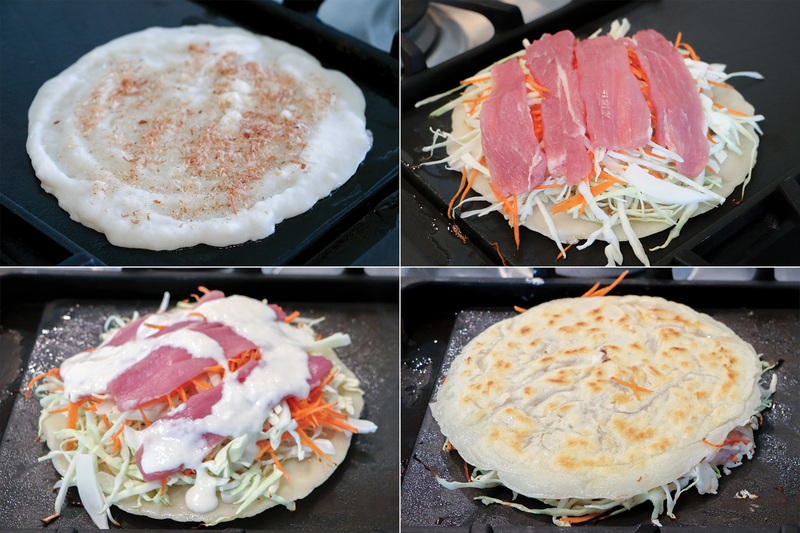 To cook the okonomiyaki, there are a couple ways to go about it. You can use either a griddle (I chose this method) or two frying pans. You can also choose to cook one okonomiyaki at a time or cook two at a time. This really depends on how many pans you have and how good of a multi-tasker you are! I suggest if this is your first time making this, stick with cooking one okonomiyaki at a time. Oil the griddle and heat to a medium heat. Pour a quarter of the batter onto the oiled surface and spread into a 7 inch circle. Top the batter with katsuobushi, ¼ of the cabbage and carrot mixture, some green onions, and place 2 strips of pork belly (or bacon) on top of the mound. I tend to use pork tenderloin because it’s healthier… and it counters all the mayo I put on top. Cook the okonomiyaki for about 10 mins, you may have to turn down the heat a bit so it doesn’t burn. After 10 mins, drizzle a little bit of batter over top the cabbage and pork and flip. Press down on the okonomiyaki with your spatula and let it cook for about 10 mins. Halfway through, cook the noodles on the griddle, season with okonomiyaki sauce or yakisoba packet seasoning, and form the noodles into a circle the same size as the okonomiyaki. 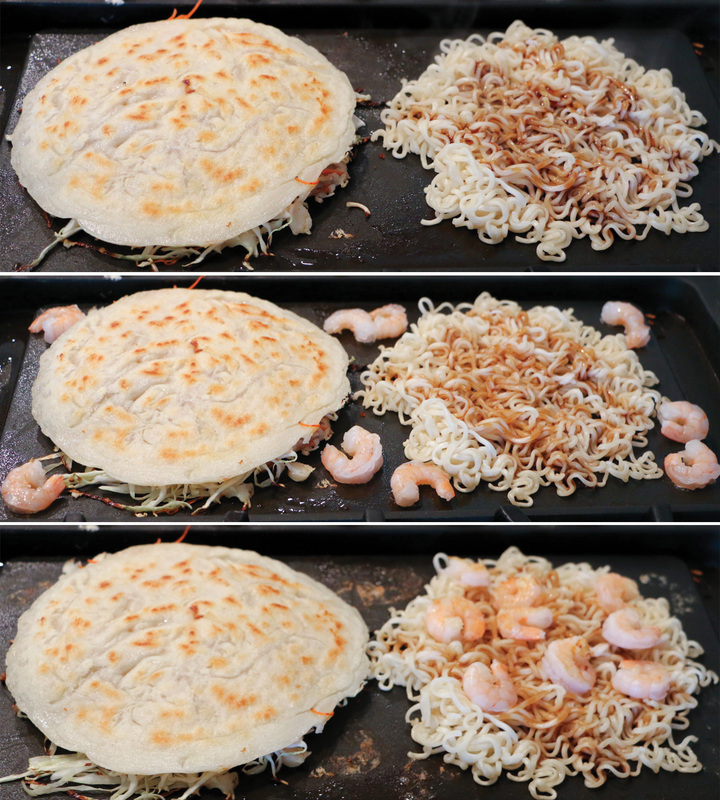 Heat up the shrimp on the griddle just briefly and place on top of the noodle. Carefully move the okonomiyaki on top of the noodle. Be sure to sweep any loose cabbage back into the okonomiyaki. Cook for a couple of minutes. Whew – we’re almost there guys, just a few more steps! Crack an egg onto the griddle and break the yolk with your spatula. Drag your spatula on the griddle on a circular motion to spread out the egg into the same size as the okonomiyaki. Move the okonomiyaki on top of the egg. Serve egg side up. Now for the toppings, add a very generous amount of okonomiyaki sauce and Japanese mayo. Sprinkle on aonori and katsuobushi. I love watching the katsuobushi dance and come to life when it comes in contact with steam from a hot dish. It always an exciting moment when someone has never seen it before! Finally, top it off with a bed of green onions and benishoga. I love this style of okonomiyaki even though it is very time consuming to make. I’ve made it one time with cheese as one of the layers and let me tell you, it was a-ma-zing! Okonomiyaki (お好み焼き) is a savoury Japanese pancake that is an instant favourite with anyone who eats it. It consists mainly of batter, lots and lots of shredded cabbage, and a multitude of additional ingredients which suits its name perfectly – “grilled as you like it”. Bring a large pot to boil, cook the noodles, drain, and reserve for later use. To make the batter, mix the flour with the dashi broth. You may need to add or reduce the amount of broth, ideally the batter should be thin but not super runny. Heat the griddle to medium and oil half of it. Add ¼ of the shredded cabbage and carrot mixture, a sprinkling of green onions, and layer on 2 strips of pork belly (or bacon). Cook for about 10 minutes, the bottom should be browned and slightly crispy. Add a little bit of batter over top the cabbage and pork, this will help keep the mixture together when you flip it. Oil the other half of the griddle, carefully lift up the okonomiyaki, and flip it onto the newly oil area. Sweep any loose cabbage into the okonomiyaki. Press down on the okonomiyaki with your spatula. Turn down the heat to medium-low and cook for another 10 minutes. Clean the other half of the griddle with a wet paper towel, make sure not to burn your fingers. After about 5 minutes (halfway through the cooking of the pancake), oil the other half of the griddle and add ¼ of the noodles to the griddle. Add about 1 Tbs of okonomiyaki sauce to the noodles and stir. (Alternatively you can sprinkle some of the yakisoba packet seasoning that came with the noodles.) Form the noodles into the same size as the okonomiyaki. Heat the shrimp on the griddle for about 1 minute. The shrimp is already cooked so it doesn’t need to be cooked for a long time. Place the shrimp on top of the noodles. Carefully lift the okonomiyaki and move it on top of the noodles. Sweep any loose bits back into the okonomiyaki. 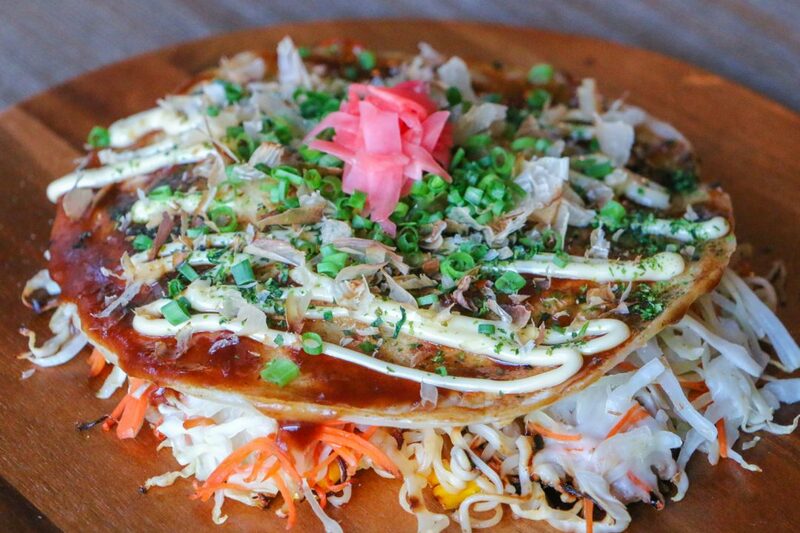 Press down on the okonomiyaki with your spatula. Cook for another 2-3 minutes. Oil the griddle and crack one egg on the griddle. 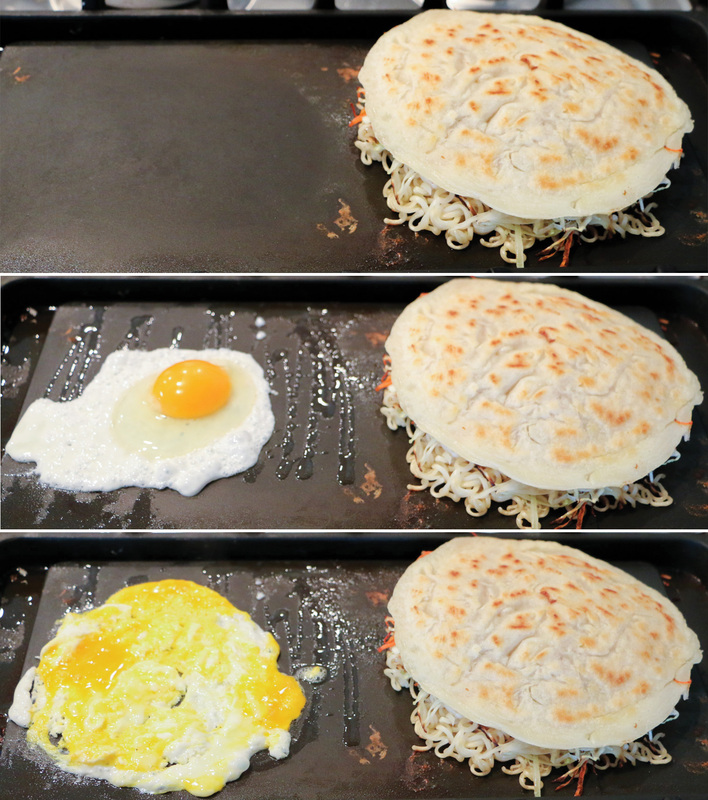 Quickly with your spatula, spread the egg in a circular shape, it should be as big as the okonomiyaki. Carefully, lift the okonomiyaki on top of the egg. Sweep any loose bits back into the okonomiyaki. 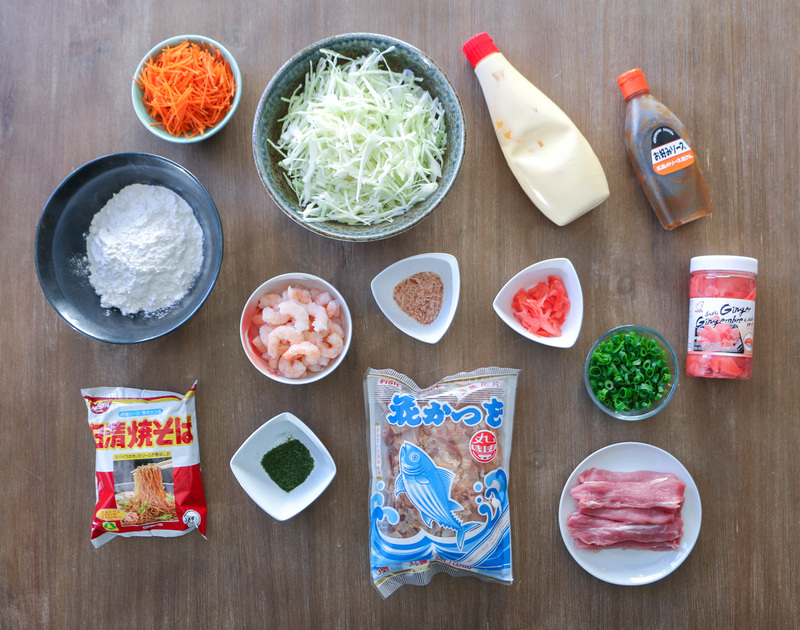 Repeat steps 3 – 14 for the other 3 okonomiyaki. Serve the okonomiyaki egg side up. Spread a generous amount of okonomiyaki sauce on top, drizzle on Japanese mayo, sprinkle on aonori (if you don’t have any on hand, the yakisoba package will have a packet inside) and katsuobushi. Add a generous amount of green onion and top with benishoga.